When I searched the web for cake inspirations for my son’s birthday, I didn’t have much to choose from. 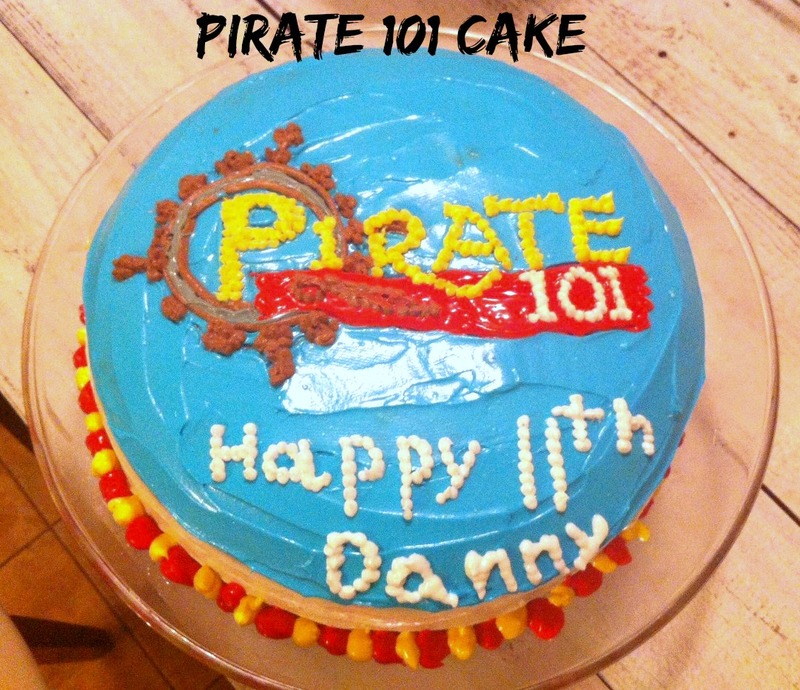 Apparently, Pirate 101 cakes are not flooding Pinterest, yet. So all I could do was copy the logo of the game and just have fun with it. In case you’re not familiar with Pirate 101, it’s a popular computer game designed by the same company that created Wizard 101. My son loves both games, but right now, Pirate 101 is his favorite. I used a red velvet cake recipe (minus the red dye) with cream cheese frosting. My kids simply love this cake and we (almost) only make it on special occasions. I used a 9-inch pan and sliced the cake twice to fill it with frosting. Then I colored the frosting with Pirate 101 colors, and piped tiny dots using a small Ziploc back with the tip cut off. 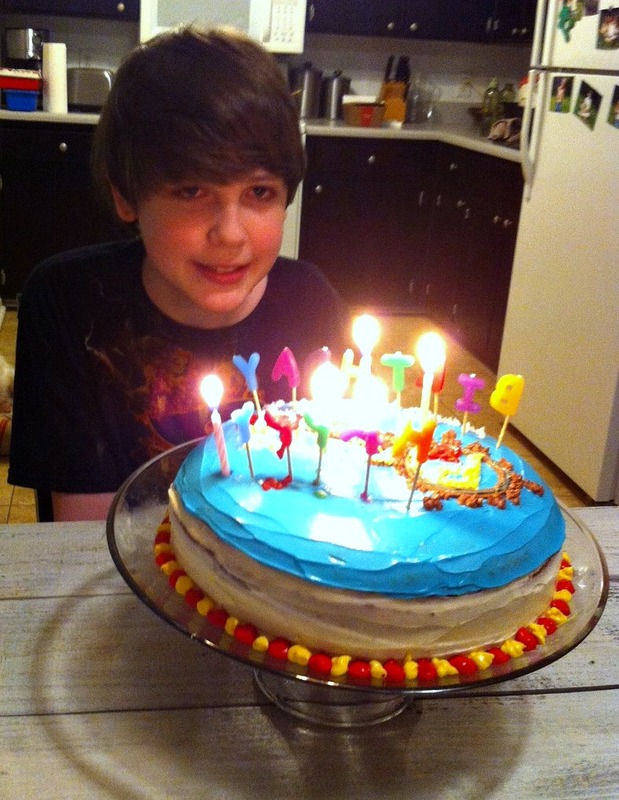 I am not a professional cake decorator – my kids pick a theme, I try to re-create it. Perfection is not the point in all of this, and no one points out flaws. Seeing their faces when they first see the cake they chose is priceless. 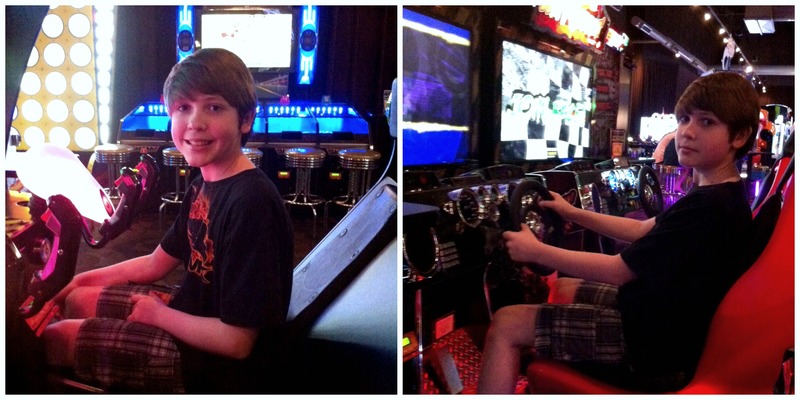 After spending several hours at Dave & Busters, my son was ready for the cake. Here are a few other cakes I have made in the past. Looks great and tasted even better! Thanks. I’m having a piece right now. I hope your kids appreciate all the effort that goes into making cakes. It’s not an east task and you did a great job. I hope you can stop by and link up with the Merry Monday Linky again next week. Thanks for the kind words. And you’re right, cake decorating is time consuming. My kids (two are in college now) still get very excited about their cakes.